Once you have downloaded the transaction list from your bank's website, you can import the file into your farm business. TIP: the file format needs to be either a csv or qif. Ask your bank if you need help with downloading your transaction list file. Go to the In the Actuals screen. Click on the upload arrow at the top right of the screen. Select the bank account the transactions belong to in your farm business. 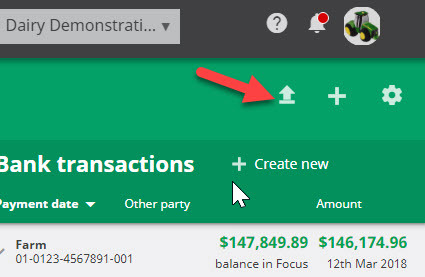 Browse for the transaction list file, it may be in your Downloads folder. coded, or matched to an invoice. Create coding rules to save time and ensure that transactions are consistently and accurately coded every time.